Golfers abandoned the stadium seating of Hopewell for more conventional links - like the 19th hole at Good Spirits bar. Pro Golf surged in attendance to 67 participants this year, perhaps as word got out that you no longer needed to stay up until 3 AM to win the event. For the second year with the 18-hole format the event finished before 1:30 am, a more palatable result for those of us duffers who require a little more sleep than in our younger years. 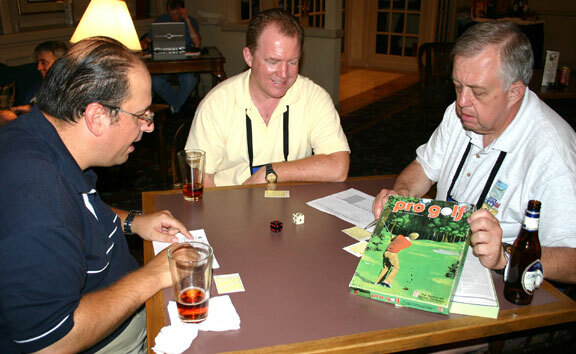 After receiving their instructions, the players scattered to play their 18 holes on the 2002 version of the Augusta course and report back their scores to the clubhouse in the plush Hopewell room (as you can tell, it is a grueling event to GM). New this year was the use of golfers from 2003, 2004 and 2005, which meant there were three Ernie Els, Vijay Singhs, Phil Mickelsons and, yes, three Tiger Woods. John Shaheen used David Toms to obtain the qualifying round lead at 9 under par, followed by Ken Gutermuth (Jay Haas) and Davyd Field (Sergio Garcia) at 7 under par. One last golfer appeared to be a lock for the last spot at six under par, until he bogeyed the last hole to drop into a three way tie for fourth place. Kevin Brown, Richard Meyer and Bruce Reiff proceeded to the first sudden death hole at Pebble Beach where Reiff's golfer, Tiger Woods, birdied the first hole to move on to the Skins game Final. These top four players were then transported to a new course for this tournament, the Lancaster Host Golf Club, for the 12 hole Skins game. We could not get the PA system going this year, so the most Reverend Keith Hunsinger did the stroke by stroke color commentary without amplification, putting serious golf commentators to shame with his biting analysis of the remaining golfer's abilities with the giant fuzzy green dice. As caddie Josh Githens predicted partway through the Final, the championship came down to a single die roll. 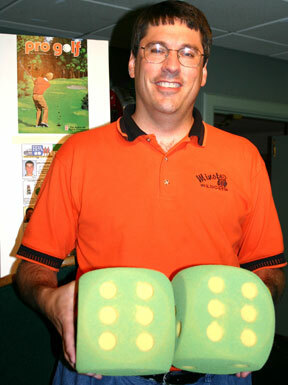 The players halved the first six holes on the course, meaning the first person to win a skin would be the WBC champion. On the par 4 seventh, John Shaheen opened with a birdie. The tension built as first Ken and then Davyd failed to match his score. When Bruce approached the tee, most of the crowd was rooting for him to get the tying birdie. Tiger Woods came through for Bruce by booming a long, superlative drive down the center of the fairway. Bruce also rolled high so that his pitch to the green landed within four feet of the hole. Since he had hit a superlative drive, the ball was to roll one die roll closer to the hole. In typical Bruce Reiff fashion, he nonchalantly flipped the die towards the wall, where it bounced, rolled onto a corner, held there for a dramatic second, then fell over for a roll of four, thus scoring an eagle on the hole and winning all seven skins and the championship. It was also the number - four - of championship plaques he'd take home this year. So the plaque king becomes the first two-time champion of Pro Golf - eleven years after his first victory. Three holes later John birdied the par four 10th to earn three skins and second place overall. Davyd won the dice roll off for third place and perennial bridesmaid Ken finished fourth in the foursome.